"I know where we are!" said the Wabbit. "Abu Dhabi!" said Skratch. "Submariners call everything Abu Dhabi," said the Wabbit. You've been had. This is Baile Atha Cliath." "Whosit?" asked Skratch. "Dublin," said the Wabbit and he grinned broadly with all of his 28 teeth. "I know my way around, Skratch," he said cheerfully. The Wabbit shook water from his fur and thought for a moment. "What are we doing here?" he asked. "We are here," said Skratch ponderously, "to retrieve an old painting, highly valued by the Department of Wabbit Affairs." "Ah," said the Wabbit as if he had known all along. "It's being held by our enemies in a secret location." said Skratch. 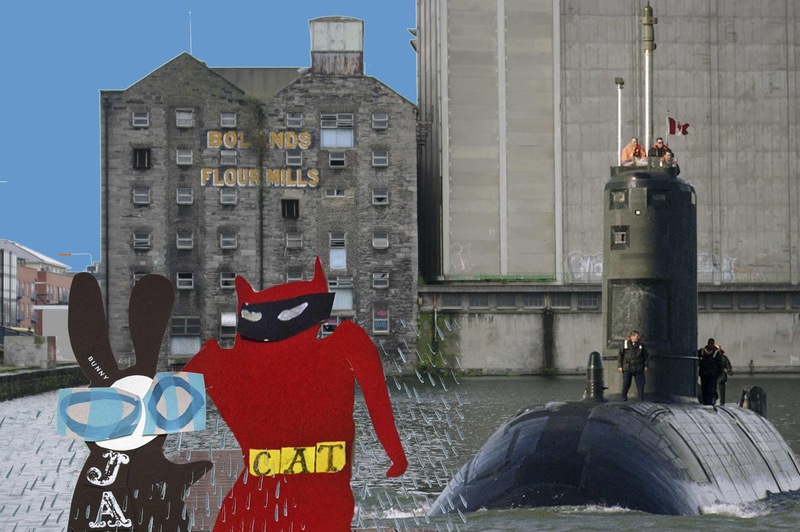 "Then lets go and get it," said the Wabbit, drying his fur by patting it with his paws then watching the droplets fall on the dockside. "How shall we pass ourselves off?" asked Skratch. "We're poets," said the Wabbit. "There's more poets round here than you can shake a stick at." "But what if someone asks me to say something," asked Skratch. "Speak in rhyming couplets," said the Wabbit. "I am a burglar, name of Skratch," offered Skratch. "Now there's a cat they'll never catch," said the Wabbit. They grinned at each other. "What about our Canadian helpers?" asked Skratch. "Undersea poets," said the Wabbit. "From Wablantis," said Skratch. "You'll do well," said the Wabbit.